At St Barnabas we are passionate about the pupils becoming competent and confident individuals who find the joy in learning and celebrate their achievements. We strive to make our curriculum relevant and exciting for the pupils, giving them opportunities to develop skills, knowledge, their understanding of the world and how to be an empathetic, proactive member of our community. 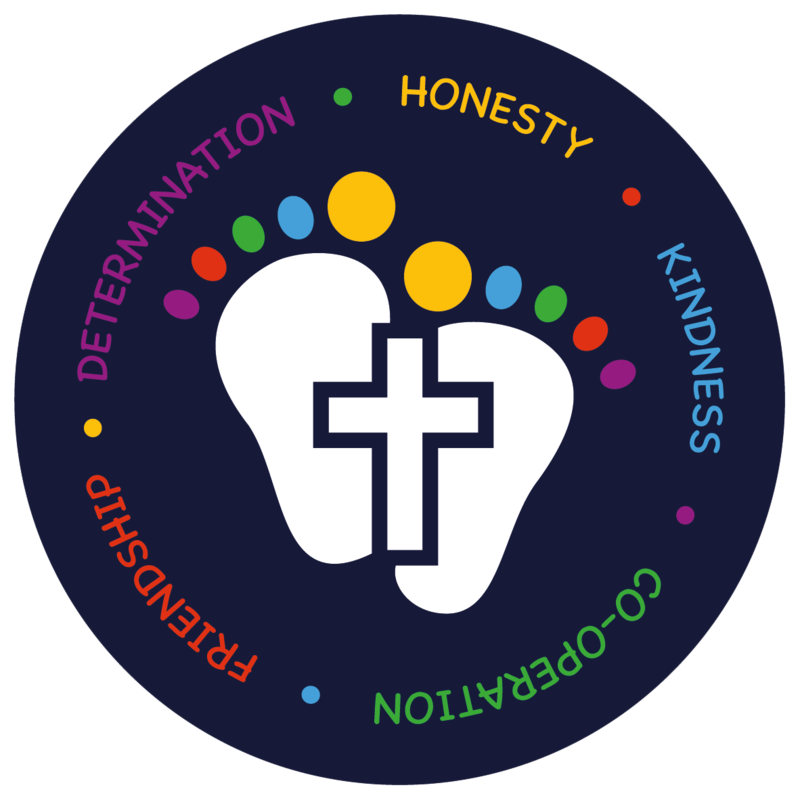 At the heart of our curriculum are our footprint values of: Honesty, Friendship, Determination, Co-operation, and Kindness. We use these to help guide the children to have a holistic experience whilst gaining knowledge across the curriculum subjects. Our school mission statement, ‘through our Christian values that we hold dear, we are developing roots to grow and wings to fly’, guides the learning and teaching ethos at St Barnabas so that we equip our pupils with the foundations and knowledge to flourish, alongside a strong set of beliefs which will support them in the future. Each child will have lessons in Maths, English (reading, writing and SPAG), Religious Education, Science, Exploration, and Physical Education. Ks 2 – Children in Years 3 – 6 will also start to learn a modern foreign language, currently French. Maths: In Maths lessons we block together learning objectives in order to consolidate learning and master skills at a greater depth. We answer a variety of questions in Fluency, Reasoning and Problem Solving to make us well rounded mathematicians. We learn and apply our skills to real life contexts so that we can make use of our knowledge in and out of the classroom. English: At St Barnabas we make use of high quality texts and stimuli to introduce pupils to a new ‘Sparkling Start’ each half term. From this text we then develop the language and grammar skills to produce pieces of fiction and non-fiction writing linked to the text. Texts include traditional tales, picture books, visual literacy stories and classic novels. Science: To allow our pupils to become innovative scientists we follow the national curriculum whilst making use of Science Bug. This allows pupils to investigate each unit of the national curriculum gathering subject knowledge whilst developing the skills to work scientifically. R.E: Using the Birmingham agreed syllabus, alongside the resource, ‘Understanding Christianity’, we explore Christianity alongside a variety of other religions. Using three key concepts; Understanding the text, visualising the impact of beliefs on everyday life & making connections to our own lives, we learn how Christianity and other religions guide our education and lives. Physical Education: Using staff who are specialists in delivering Physical Education lessons, we ensure full coverage of the national curriculum, take years 3 – 5 swimming and provide a varied programme of after school clubs for the children to sample even more sports and leisure activities. Exploration: To ensure that our pupils are inquisitive about the world around them and that they are able to ask meaningful questions about their place in it, we have developed Exploration lessons. These lessons are all about developing skills, whilst exploring the world through the eyes of historians, geographers and artists. In all year groups and at all stages teachers use assessment continually to reflect on the needs of the pupils. Using this information teachers adjust their lessons to address misconceptions and move the pupils’ learning forward. This may mean sometimes that timetables are altered to prioritise progress and attainment in key subjects like English and Maths. Every new half term we start our learning journey with a themed week to focus the children’s learning around a specific area or issue. Values Week – as a school we create class charters and talk about the values we hold dear as individuals, as classes and as a school. We also explore our Christian values, what makes our school special and how we show these values through our actions. Black History Week – we spend time learning about key people and points from Black History. This year we are doing this through music and how it has been used to reflect cultural and political beliefs over time. Family & Friendship Week – during this week we talk about how families come in all shapes and sizes. We discuss keeping safe both online and in our everyday relationships. We spend time learning about how we can communicate with friends and family so that we are understood correctly. Eco Week – for a week we become Eco Warriors! We look at the school and the local community to explore issues that we need to improve to become more eco-friendly. Using our science investigation skills and art/design techniques we come up with ways to try and make the problem better. Art Week – each year group is assigned a different medium; Architecture, fashion, painting, sculpture etc. During the week classes explore this medium, how it has changed over time, key artists from the field and have a turn at producing some art work themselves. Flight Week - Pupils will have spent the year creating roots to grow but this week celebrates their wings to make them fly. The pupils are challenged to make a flying machine using their design and technology skills that takes with it a message of hope. Each year group will explore and evaluate existing products and design then make a new version of their own. Geographical Comparison Study: 3 place overtime, one from the UK, Europe and a non-European country.